The simplest political systems are found in bands and tribes. To the casual observer from the outside, these kinds of societies do not seem to have leaders in the sense that we commonly expect. Political power is essentially diffused throughout the society. Subsequently, they have been referred to as being acephalous (Greek for "without a head"). Bands have been found primarily among foragers, especially self-sufficient pedestrian foragers. The total number of people within these societies rarely exceeds a few dozen. Bands are essentially associations of families living together. They are loosely allied by marriage, descent, friendship, and common interest. The primary integrating mechanism for these societies is kinship. Bands are extremely egalitarian--all families are essentially equal. There is no economic class differentiation. However, there are often clear status differences based on gender and age. There is a horizontal status and power relationship in bands between all adults of the same gender. They are more or less equal as far as community decision making is concerned. However, some individuals in a band stand out for their skills and knowledge. These often are the people who have the best memories, are the best hunters, most successful curers, most gifted speakers, or have some other special ability. Such people become informal leaders. Most often they are given authority by community consensus arrived at through casual discussion without the need for a formal vote. This is possible because the entire society is small and everyone knows everyone else intimately as a result of living and working together throughout their lives. Band leaders generally have temporary political power at best, and they do not have any significant authority relative to other adults. They can give advice and propose action, but they do not have the formal authority to force others to accept their decisions. The principle goal of politics in most bands is making sure that people get along with each other. This is not easy given human nature. There is always the potential for social disruption brought about by individuals failing to share food, sexual competition for the same mate, or other personal conflicts. Given the small size of bands and the fact that everyone is involved in the lives of everyone else, quarrels quickly become community problems that have the potential for splitting the band along family lines. In fact, band fissioning apparently has been a common occurrence. As the number of people in a society increases, the potential for disruptive interpersonal conflicts inevitably rises. Subsequently, the likelihood of families deciding to leave and form their own bands increases. Richard Lee has referred to this process as social velocity. He observed that among the ju/'hoansi of southwest Africa, fissioning often occurred before a community reached the full carrying capacity of the environment. In other words, it was not food scarcity but, rather, social discord that was the cause of the break-up. Typically, there is no leadership position in bands that has the authority to conclusively settle disputes, punish criminals, prevent families from leaving, or represent the entire community in dealings with outsiders. Decisions are made by community consensus, but people who don't agree with the consensus generally do not have to accept it. During the late 19th century, this highly democratic diffused political system of bands made it difficult for the U.S. government to create binding treaties with some Native American societies in the West. It was naively assumed by the federal government that when "spokesmen" for a band agreed to a treaty that it legally bound all members of their society to its terms. From the perspective of the band members, it really only obligated those specific individuals who agreed to the treaty. If others in the band failed to follow the terms of the agreement, the federal government assumed that they were going back on a legal agreement. This cultural misunderstanding on both sides was the consequence of having radically different kinds of political systems as well as profound ethnocentrism. Ethnographic accounts suggest that the political power and status of women in many pedestrian foraging bands was surprisingly high, especially compared to pastoralist and agricultural societies. 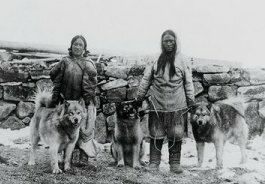 Since forager women in all but the cold polar regions usually provided most of the food calories consumed, they performed economically critical roles for their families and society as a whole. Men generally hunted for meat. This was often the most desirable but usually the least dependable food source. The central economic role for women in providing vegetable foods, along with traditions of diffused political power in bands, allowed women to voice their opinions at important community meetings. Clearly, women in some types of foraging societies had significantly less political clout. The status and authority of women in aquatic and equestrian foraging societies was usually far lower than that of men. This may be due to the fact that men generally provided most of the food in these societies that depended on meat as their principal source of calories. In addition, the passionate military focus of equestrian foraging societies put men in a position to dominate political decision making. No band level societies survive today with their traditional form of political organization intact. However, they did until the last half of the 19th century in out-of-the-way regions of northern Siberia, the desert and sub-arctic regions of North America and Greenland, the tropical lowlands of Central and South America, the Australian desert interior and tropical north, as well as a few isolated areas of Southeast Asia. While it is easy to think of these people and their traditional way of life in the past as oddities, it is important to keep in mind that the distant ancestors of all people on earth lived in bands at one time. Before the end of the last ice age, around 10,000 years ago, it is likely that very few societies had more complex levels of political integration. A tribe is a somewhat more complex type of acephalous society than a band. As the population size increases with a shift in subsistence pattern from foraging to horticulture or pastoralism, it eventually reaches a point at which kinship ties and friendship are no longer sufficient to hold society together. This is especially the case when there are hundreds of people and multiple communities. Tribes also are characteristic of some large equestrian and rich aquatic foraging societies. Regardless of the subsistence base, new forms of societal integration become a necessity in tribes to settle disputes and prevent the society from disintegrating. The new integrative mechanisms of tribes are referred to by anthropologists as pantribal associations or sodalities. These are groups that cross-cut the society by bringing together a limited number of people, typically at least one from each family. 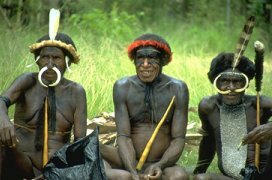 Pantribal associations often are in the form of councils, groups of elder men or women who are members of the same age set, warrior societies, religious cults, or secret societies. While these groups have specific purposes, they also serve to create order and a sense of unity for a tribe. In a number of tribal societies of New Guinea, all men traditionally lived together communally in a "big house," while women lived with their daughters and young sons in their own individual houses close to the gardens where they farmed. Older boys went through an initiation ceremony in order to become a man, move into the "big house", and learn the religious secrets kept by men. In these societies, men made the important political decisions. 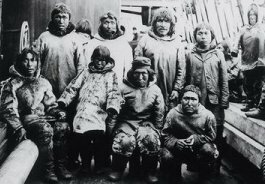 The group of men living in the big house acted as the pantribal association that cross-cut society. 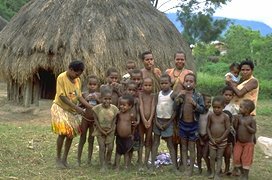 Even in New Guinea societies that did not have a tradition of "big houses", the important pantribal associations were most often made up of men as they are in most tribal societies. Subsequently, men had more political power and prestige than women. Tribes commonly have village headmen who perform leadership roles, but these individuals have relatively limited authority. Political power stems largely from their senior position within kin groups and their ability to persuade or harangue others into doing what they want. In New Guinea and many of the neighboring islands of Melanesia, these leaders are called "big men." In the past, there often were competing "big men" who vied with each other for status and nominal authority over a number of villages. They worked for years to accumulate pigs and other items of high value in order to give them away in large, very public formal ceremonies. This functioned to not only enhance their status and political influence but to also redistribute wealth within their societies. A similar ritualized economic redistribution was orchestrated by the leading men among the Kwakiutl and some other rich fishing societies on the northwest coast of North America. Their principle goal was also to increase their status and power. Like bands, most tribal societies are still essentially egalitarian in that no one family or residential group is politically or economically superior to others. All families are basically alike, including those of the headmen. They are for the most part self-sufficient in regards to food and other basic necessities. However, tribes differ from bands in the way that they are integrated. They are also larger societies. Tribal societies have suffered the same consequence of contact with the large-scale societies. There no longer are any tribes that have been able to maintain their traditional political systems unaltered by outside influences. The next section of this tutorial describes societies that eventually departed from the age-old egalitarian systems of bands and tribes and developed chiefdoms and states. These were political systems that had progressively more centralization of power. NOTE: Native American societies have been commonly referred to as tribes. They have been lumped into this category without regard to their actual level of political integration. In western North America and the sub-arctic north, they most often had bands. This was especially true in the desert regions where population densities were low. Tribes were common among the agricultural peoples of the Southwest (Pueblo Indians). In the eastern woodlands, tribes and more complex chiefdoms were widespread. During the 20th century, Native American societies throughout the U.S. changed their political systems to what are now usually referred to as "tribes." However, these new political systems generally reflect more the European concept of representative democracies with written charters, elected tribal chairmen, and councils. The same kinds of political changes occurred among the indigenous populations of Canada, but there they are referred to as "first nations."